Following are the possible number of ways to perform Matrix Multiplication in CUDA. 1. Simple Matrix Multiplication in CUDA. 2. 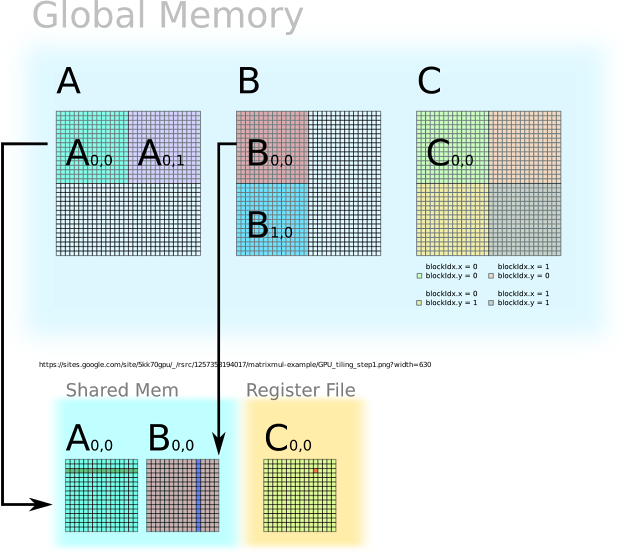 Matrix Multiplication in CUDA by using Shared Memory. 3. Matrix Multiplication in CUDA by using Shared & Constant Memory. 4. Matrix Multiplication in CUDA by using TILES. 5. TILED Matrix Multiplication in CUDA by using Shared & Constant Memory. The above sequence is arranged in the increasing order of efficiency & performance, 1st being the slowest and 5th is the most efficient & fastest. One may be confused after reading all these possible number of ways to implement Matrix Multiplication in CUDA and must be wondering that what is the difference between all these ways. Let me tell you that there are Global Memory, Constant Memory, Texture Memory, Shared Memory and Registers present in CUDA. One can use at least one or all of them to implement the algorithm. Just kip in mind that Global Memory is the slowest and Registers are the fastest memory in CUDA. So, it is obvious that if you use faster memory you get output fast. The same statement can be said as if Latency of the memory is less then it gives output quickly. Go through the following code to understand the algorithm used in the TILED Matrix Multiplication using Shared Memory. You can also get it from my GitHub repository. int Row = blockDim.y*blockIdx.y + threadIdx.y; //To generate ids of threads. Amazingly explained. It helped me to clear multiplication concepts. Thank You Pavan Jaiswal. Please stay connected to get more of the Blog. I hope you will find it very useful.